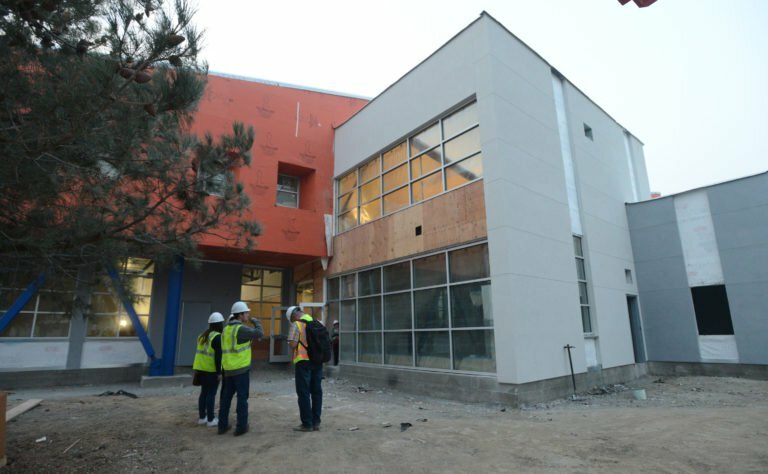 FAIRFIELD — With a few more months of construction remaining, a new library complex going up at the Public Service Academy isn’t merely a concrete box for books and magazines. Instead, construction crews are quite literally building the future. The two-story complex will include a library, classrooms, a college and career center, an innovation lab, outdoor patio and the type of steel and glass construction one might expect in a building on a campus for Google or Facebook. One of the district’s architects, Mariana Alvarez-Parga, said the building’s design was meant to be a place that would encourage students to want to come and stay. Although the building has a modern feel, Alvarez-Parga said the design includes a number of elements to help tie it to the existing campus, much of which was built in 1965. The Public Service Academy’s unusual student body makeup, fifth through 12th grades, presented some challenges for designers who had to cater the building to be as inviting to an 11-year-old as it is to a student about to graduate high school. “This flexible collaboration area works perfectly for teaching within all of those areas,” Van Gundy said. That wasn’t the only challenge builders faced. While the building looks like something out of Silicon Valley, Van Gundy said they had to design and build with an eye on the rapid evolution of technology and how technology is shaping learning. “Think about where we were five years ago and just assume we’re going to change that much, if not even quicker, in the future, so we want to make sure these spaces can transition with us as those changes develop,” Van Gundy said. That rapid evolution isn’t all that is moving along quickly. Often, new construction on existing school sites are gems to be unearthed by future generations of students. Not so at PSA. Barring unforeseen setbacks, Alvarez-Parga said she anticipates the library complex should be completed by the end of February or into early March, which will leave just enough time for graduating seniors to enjoy a bit of that new library smell before departing school for good.